Marietta dentists, Kirk Kimmerling DDS, Alex Krempa, DMD and Suzanna Aguilera DMD are proud to announce fiteBac SkinCare Germicidal Hand Softening Gel is now available for purchase in the dental practice, Verde Pointe Dental Associates. The Marietta Dentists are pleased to offer a product that is on the forefront of antimicrobial technology, as they plan on being the first in the country to introduce to patients the advanced antimicrobial dental materials from Dr. Kimmerling's biotechnology company, fiteBac SkinCare, LLC. The local dentists has formally announced product for sale, as it is a skin- friendly formulation that is free from the traditional alcohol in hand sanitizers. "We are currently introducing fiteBac to the dental and medical communities at trade shows and in print, and have had an overwhelming response from third party experts that have evaluated the product and patients interested in purchasing our hand sanitizer while they were in the office," says Dr. Kimmerling. “Our dental office is excited about the patent pending platform antimicrobial technology of Kimmerling Holdings Group, LLC, the parent company of fiteBac SkinCare, LLC. We are actively working with our researchers on products that will dramatically improve dental materials and patient results." Dr. Kimmerling is a partner in a biotechnology firm with significant antimicrobial technology. 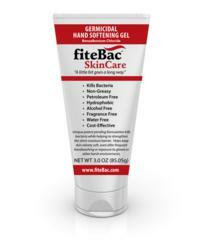 fiteBac SkinCare Germicidal Hand Softening Gel is the first product of many in the pipeline. The Marietta dental office offers fiteBac Hand Softening Gel in three sizes, one and three ounce tubes and eight ounce bottles. fiteBac has had an excellent reception by patients. “I have used Dr. Kimmerling as my dentist for years, and he has always had the latest and up to date equipment, providing me with excellent care. It is no surprise that he's developing products for dentists. His hand sanitizer leaves my hands feeling so smooth, I carry mine with me!” says patient George Tingley. Dr. Kimmerling is a graduate of Emory University School of Dentistry, and has a Bachelors of Science in Chemistry, also from Emory. He has been practicing dentistry for over 30 years. His education and dental career, and experience with the latest dental materials, have combined to provide him with the unique insight necessary to partner with others and form a biotechnology company that is positioned to address shortcomings in existing materials. He is the President and CEO of Kimmerling Holdings Group, LLC and fiteBac SkinCare, LLC. Dr. Kimmerling and his partners, Dan Kearney, Co-Founder and COO, and former Dow Corning executives, John Blizzard, Chief Inventor/Chemist and Robert McKeller, Legal Counsel, are working with researchers from universities and private industry to advance highly sophisticated antimicrobial technology that extends well beyond dentistry. Drs. Krempa and Aguilera are both pleased to partner with Dr. Kimmerling in his dental practice. "It is our pleasure to work with a dentist that has a surplus of passion for dentistry. We are excited for the arrival of other products to come, and it's fantastic to know they will be offered in our office first," says Dr. Krempa, Associate, Verde Pointe Dental Associates. All three cosmetic Marietta dentists are highly accomplished and welcome the future products. The cosmetic dentists in Marietta, offer a variety of dental services and products; consultations, dental cleaning and exams, teeth whitening, while colored fillings, emergency services, extractions, root canals, crowns, bridges, implants. It is a full service dental office practicing family dentistry, emergency dentistry and general dentistry from ages 3 to 103. New patients are welcomed to the state of the art office, as it provides a friendly, welcoming environment, as well as technology of the future. Kirk Kimmerling DDS Marietta, Alex Krempa DMD and Suzanna Aguilera, DMD are cosmetic dentists in Marietta, GA that are literally paving the way for the future of dentistry. The office is technologically sophisticated in not only equipment and procedures, but also developing dental materials via Kimmerling Holdings Group, LLC and fiteBac SkinCare, LLC, Dr. Kimmerling's biotechnology firms. The office is a 13-operatory facility with televisions in each to display digital x-rays, intra-oral pictures, and patient education. The office is highly advanced using technology such as Logicon, a program that allows for the ability to digitally measure the extent of tooth decay allowing for the detection of 20% more cavities and preventing misdiagnosis, and “Collimators,” a conduction of x-ray tube heads that decrease radiation exposure to the patients and staff by 5-fold, an advanced restoration impression system and digital scanner called the iTero that produces more accurate restorations than traditional methods. The overall well-being of each patient is addressed by adding a DNA salivary test, which allows the office to determine a patient’s specific risk of periodontal disease as well as certain types of oral cancer. The office is the first to use fiteBac SkinCare Germicidal Hand Softening Gel, an advanced hand sanitizer without the harshness to skin from traditional alcohol-based hand sanitizers. Drs. Kimmerling, Krempa and Aguilera invite new patients to meet their exceptional staff and experience the one of a kind dental office. The dentist office hours are kept convenient for all.